For those who've been wondering, my ankle is feeling better every day. I'll just be careful to leave extra time for getting places on the tour, and I'll resist the urge to rush to catch planes. I intend to set new records for packing light. Inspired by Laurie Halse-Anderson, I'll take a picture of my tiny luggage and post it here if I get the chance. Of course, Laurie was packing for a five-week tour. Mine is only a week and a half (because I am a WIMP). So make sure you're duly impressed by Laurie's feats of packing! For any readers with ebook devices, there's currently a free sampler of my work available at Amazon, Barnes & Noble, and Apple's iTunes Store. The sampler contains excerpts from Graceling, Fire, and Bitterblue, plus an extra thingamajig: some (silly!) letters that Bitterblue, Katsa, Raffin, Bann, and Po wrote to each other during the spring before Bitterblue's 18th birthday (in other words, in the spring before the events of Bitterblue take place). Just search for my name and it should come up. Someday, I will have a plane to catch and not feel like I'm on the wrong side of an insurmountable To Do list. I'm sorry guys, I have lots of good books I want to talk about, but I just can't get it together right now. I also want to talk about So You Think You Can Dance Australia (that link will open one of my favorite group routines from season one), which is different from the American show in a number of refreshing ways (less homophobia!). But there's no time! ACK! I fear it's going to be this way until the Bitterblue release. There is so much to do. I should have tour details soon. In the meantime: local people! My first tour event is at the Main Branch of the Cambridge Public Library at 6 PM on May 1. Porter Square Books will be there, selling books. A book release can be overwhelming. A lot of factors converge at once. Reviews, to be honest, don't really faze me, but they do create a lot of swirling noise. There's a lot of noise in general during a book release, and when you're trying to ground yourself in what matters, noise can be decentering. Also, during a book release, a writer is transitioning from working alone in a room on an intensely private project to being the star of public speaking events :). Am I nervous about that? Sure. Nerves contribute to the release being overwhelming. The response of my two-year-old niece, codename: Isis, when she saw the ARC of Bitterblue: "It no have pictures in it." Well, guess what, Isis? You're going to like the final version of the book better, because it does have pictures in it. The lovely Ian Schoenherr, who most recently did the art for The Apothecary, has created maps, castle diagrams, various Appendix illustrations, endpapers, the cover page, ornamental chapter openers, and, probably my favorite illustrations of all, double-spread part openers (the book is in five parts) for Bitterblue, and the final result makes me SO HAPPY. 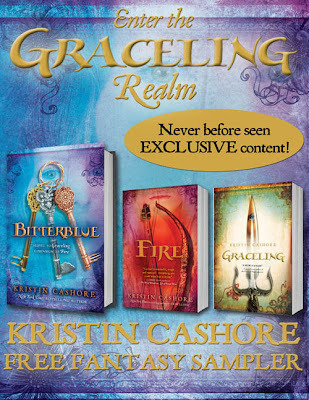 If you "like" the Graceling Realm page on Facebook, you'll have access to some of the art, which is slowly being revealed there. Hey everybody, sorry for the radio silence this past week. I've been on the road. I plan to be back next week, hopefully with some info about the Bitterblue release. Until then, I thought I'd share this beautiful little video of a book being born. Make it big on your screen; it looks great. Thanks, Jess.